One way to beat winters chill and avoid indoor cycling is to slow the bike down. Mountain biking is the only way to roll on sub freezing days. I do this by putting a super heavy wheel/tire combo on and running ultra low air pressure. Trust me, you won't spend much time over 15 mph. There is a HUGE difference in windchill between a 11mph average and 19mph average on über cold days. Plus the 'dar' woods gives additional protection from wind. I gotta believe the extra resistance is good for building leg strength. It's a win-win albeit a chilly win-win. If you despise indoor cycling like I do this is a great option. I went for the double crown last Sunday. The triple crown is riding Mt. Kessler, Mt. Sequoyah and Lake Fayetteville. The double is any two of the three. Ended up with almost 3 hours inside the city limits. Fayettevillians you have it so good when it comes to mountain biking. Three trail systems and little to no driving. Get out! Enjoy these great trails. Don't let winter slow you down! 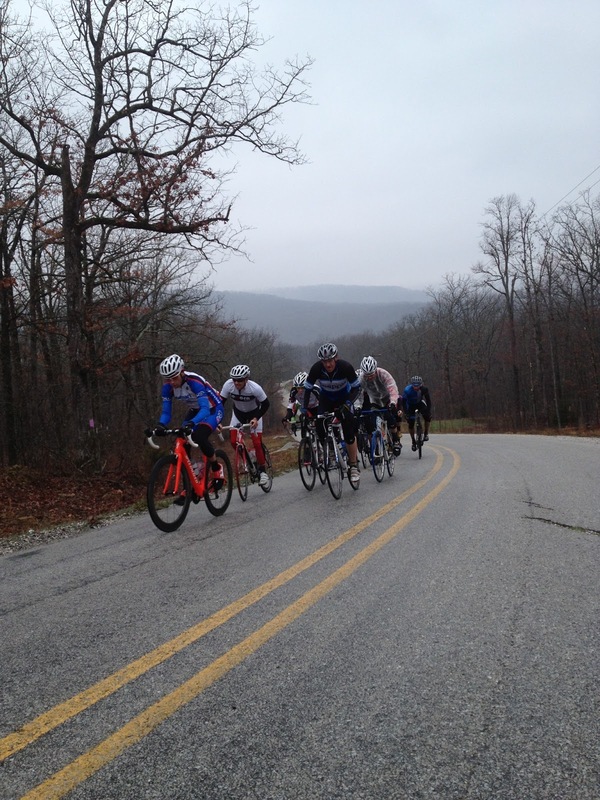 First team ride of the winter training season. New sponsors, new members and new equipment on tap. Even the cold temps couldn't stop us from enjoying this ride. Getting together once a month to ride and break bread keeps the guys connected and builds camaraderie. I planned the route and put in as many city limit signs as possible. We had a friendly competition old heads vs young bloods. Good times. I'm sure I will thank our sponsors a ton throughout the racing season but let this be the first. Three Happy Cows makes delicious yogurt! They are based out of Dallas, TX and we are super excited to partner with them. Check them out on Facebook and look for them on the shelves! We all know what falling on the bike means. Broken collarbone, elbow or wrist. I've broken my collarbone three times (oddly enough not on the bike). Shoulder Center of Arkansas has us covered when it comes to shoulders and other sports related injuries. I know they would love to take care of you to! Check out the link below to see what services they provide. Needless to say I am excited to represent these companies next year on the bike. They make it possible for someone like me to participate in this great sport. I am convinced that racing on the local/regional level is the true heart of the sport. Amateur cyclists are the life blood of the industry. It makes perfect sense for many companies to get involved with the people that actually purchase the products and services they produce. Lean properly. New bikes have started to arrive. Thanks TBR! Fuel for the ride. Thanks CLIF BAR! 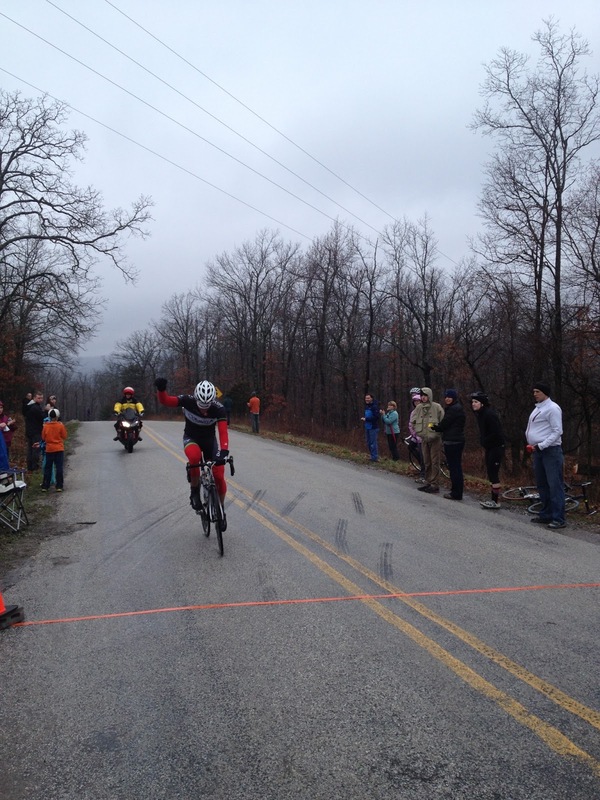 White bull is a famous landmark in the NWA cycling community. WHF is grateful for the following and The Bike Route is pumped to keep you warm on the bike this winter. You will need to scroll down to my profile (bottom) click on my name then click email. You can reach out to me via email to collect your prize! Stay tuned for more cool giveaways and head on over to TBR to start your Christmas shopping today! Tell them Wheels Hot Fayetteville sent ya! You can friend me on Facebook for updates on future posts. Whirlwind puts it mildly. 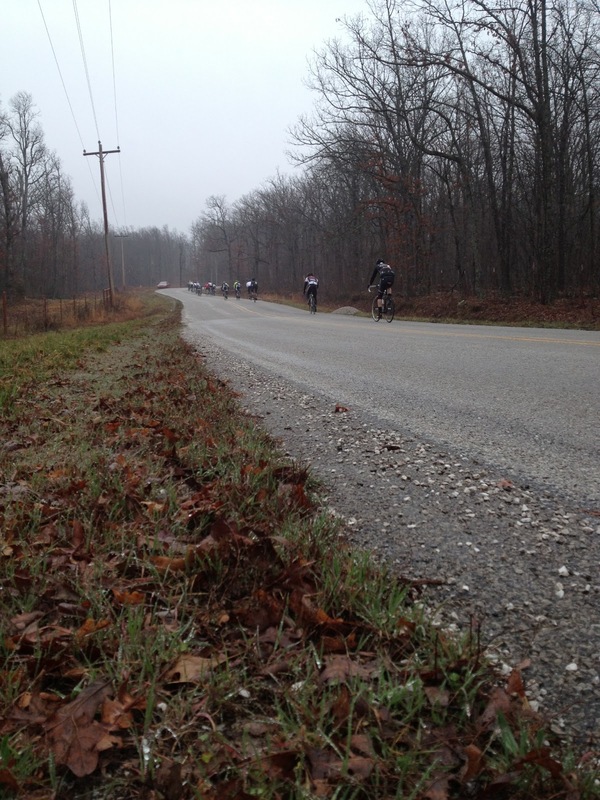 Tasted our first real wind of the fall/winter riding season on Saturday. Blustery wind in fall and spring are telltale signs that the seasons are really changing. I didn't factor in the wind when deciding on what route and direction we would ride. We spent most of our time in the teeth of it. Another great group clipped in to toil with the elements. These are the days I prefer the bunch over the solo. I went with a version of Round Mountain loop keeping us close to town if the weather turned. Echelon skills put to the test. Round Mountain to the left. Round Mountain is a deceptive climb. You really start going up once you turn off 45. After the second pitch you have this scenic expanse. Still going up though. Today it was a wind tunnel. Three more stairs to step. Each one getting steeper & longer. A day when you wish you could use the entire road. Finally the wind at our backs for the last few miles. Had some guys from the Walmart team come down from B-ville. Good times and thanks for making the drive. The OORC (Ozark Off Road Cyclists) completed the last bit of trail yesterday making Mt. Sequoyah a legit loop to ride. I gotta say the work they've done is impressive. The new section is easily the smoothest section on the entire 5.7 mile loop. Heath & Zach, a couple of the guys who have been working on this project are encouraging folks to get out and ride it. It will help with compressing the soil. Between Mt. Kessler, Lake Fayetteville & Mt. Sequoyah the city of Fayetteville has some great options for the MTB and you have no need to get in your car. For those living around the area be sure to bring the MTB the next time your in town and check out these fine trails. What did it take to finish the trail? For more information on the OORC click the link below. Check out the compression on the front tire. Cool crisp morning, perfect fall weather. A great group showed up to tackle the Tripleberg Loop (3,000 feet of gain in 50 miles). The bunch was in a good mood and the ride had tons of spirit. It's just too nice outside to not ride this time of year. One of the things I enjoy about cycling is socializing or not socializing. It's perfectly fine to keep to yourself in the bunch or you can chat it up. Lots of places to hide from the wind today. About 25 or so. We had a few Cat 5 moments. I love the four seasons. First regroup after the Lincoln climb and city limit sprint. One of my favorite stretches. The view after this rise is spectacular. Some brilliant colors at the top of four corners. This descent always makes me smile. Someone said it was like a great ski run. Perfect description. Great morning. In good company. Lo-vember. Grow leg hair in November. It could be the next great awareness movement. What should we make folks aware of? For the last two years we moved the finish line of the Hell's Kitchen road race to the top of the HK climb. We did this to mix things up. It totally changed the dynamics of the race. Now we are considering moving it again for 2014. Here is your chance to weigh in. Mountain top finish or not? Leave a comment at the bottom of this post. How do I leave a comment? Good question. Step 1: Click on the down arrow button where it says "comment as." Step 2: Select Name/URL & type your name, click continue. Step 3: Enter your comment & click publish! Curious about Hell's Kitchen? Click on the link below to see my post from this years race.